The Flapper Squad of the Boston P.D. 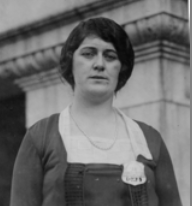 Irene McAuliffe, one of the first six female members of the Boston Police Department. Every March, Women’s History Month celebrates women’s contributions to events in history and society. While there are many strong female historical figures in the Piper Houdini novels (Bess Houdini, Mina Crandon, Dion Fortune, to name a few), for Women’s History Month I wanted to recognize a pioneer who paved the way for other women to follow. I am speaking about Irene McAuliffe, a character who plays a minor role in the first novel but played a major role in breaking down gender barriers in law enforcement. Along with two housewives, a nurse, and a social worker, McAuliffe was among the first women to join the Boston Police Department. Irene McAuliffe grew up in Weston, Massachusetts. She was the daughter of Patrick “P.J.” McAuliffe, a horse breeder, undertaker, and the town’s first police chief. An accomplished horsewoman, Irene McAuliffe was sworn in as a mounted officer of the Weston Police Department in 1913 during the town’s bicentennial celebration. In 1919, a police strike in Boston had decimated the department’s ranks, making it a golden opportunity for women to apply. McAuliffe had joined the Washington, D.C., Police Department in 1920. But she returned to Massachusetts the following year to take the civil service test and join five other women as members of the BPD’s vice squad. The women officers, who ranged from 25 to 35 years old, were dubbed the “flapper squad” by the press. They were hired to watch out for young women in the city, who authorities feared were falling prey to “mashers”—skirt-chasers who lurked in movie theaters, parks, and beaches. Their supervisors wanted them to keep young women from haunting nightclubs and track down runaway children (which is why in Chapter 4 of the first novel, McAuliffe and her partner Irene Bohmbach escorted the wayward Alan Crandon back home). Even though they had to face armed criminals, gangsters, and bootleggers, Boston’s policewomen were not issued guns or uniforms until 1972. Their bosses showered them with awards and citations, but never promoted them. 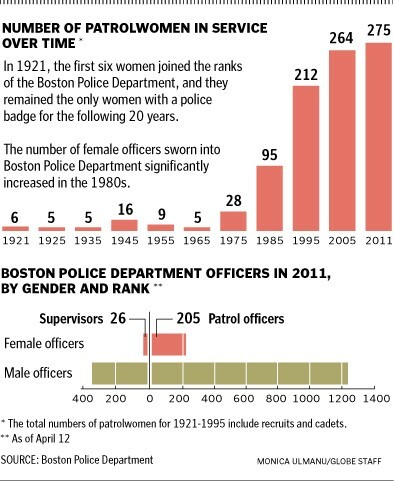 While the BPD remains a male-dominated bastion—women represent about 28 percent of the city’s 2,712 sworn officers (up from 13 percent in 2011! )—women have made tremendous strides from second-class citizens in the 1920s to full-fledged members today who can carry guns and rise in the ranks as high as police commissioner. Tagged #Houdini, Boston Police Department, BPD, flapper squad, International Women's Day, Irene Bohmbach, Irene McAuliffe, strike, Women, women's history month.